"I hope Obama wins just because ... the country needs it"
Rock says he can't support a guy like McCain with "12 houses"
(CNN) -- Republican presidential candidate John McCain is just holding on like a boxer before he gets knocked out, comedian Chris Rock says. 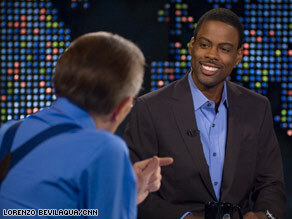 Comedian Chris Rock told Larry King he's proud of Barack Obama's character. Rock, an avid supporter of Democratic presidential nominee Barack Obama, spoke with CNN's Larry King on Thursday. He said Obama is more grounded with your average American -- not somebody like McCain with "12 houses." "The other guy [McCain] can lose five houses," Rock said. King began the interview by asking Rock about Thursday's economic bailout talks when Obama and McCain went to the White House for discussions with the nation's top leaders. KING: Obama and McCain at opposite ends of the table. What do you make of it? ROCK: What do I make of it? If this was a boxing match, McCain would be holding. ROCK: Yes. It's like he got hit really hard in the stomach like, 'OK. I can't let him go. He's going to knock me out.' So that's what appears to be going on right now. Just a hold. KING: Has the financial crisis affected you? ROCK: Larry, I drove a cab over here tonight. When it's over, I'm going to try to pick up some more fares. I'm losing everything, Larry. ROCK: Yes, it's real bad. KING: Have HBO paid you already? ROCK: They have paid me, but the money is worthless now. Haven't you heard? Your money's worth nothing. KING: You must be ... proud that at this stage in our history a black man is running for president on a major ticket. ROCK: Um, you know what? I'm proud Barack Obama's running for president. You know? If it was Flavor Flav, would I be proud? No. I don't support Barack Obama because he's black. KING: I said just as a proud feeling. That's normal. ROCK: There's a proud feeling because of the character of the man. You know, I was -- I supported John Kerry and, you know -- and what's my man? Al Gore. ROCK: But this guy seems to be a little bit more. He seems to have watched other peoples' mistakes and, you know, seems to have a little bit more going on. KING: From a comedic stand point, who is funnier, McCain or Obama? Seriously. Is Obama not -- it's hard to be funny about Obama? ROCK: No, no. It's weird. People ask me that all the time. ... McCain jokes are just easy jokes, like I don't want a president with a bucket list. That's like a McCain joke. Those jokes are easy. It's like you basically, you know, you know, take the dust off your Reagan jokes and tell them again. You know? But Obama, oh, this is a whole new set of jokes. I got to find a whole new move to the basket here. So I kind of hope he wins. KING: Didn't you introduce Obama at a rally? ROCK: I introduced Obama at the Apollo Theater not too long ago. I think Obama would be great. I mean, just look the big thing right now is the economy. And people are going broke. And here: The choice isn't Republican or Democrat. The choice is you got a guy that's worth $150 million with 12 houses against a guy who's worth a million dollars with one house. ROCK: The guy with one house really cares about losing a house, because he is homeless. The other guy can lose five houses and still got a bunch of houses. Does this make any sense? Am I the only one that sees this? ROCK: I'm just saying, John McCain could lose half his houses. KING: You and Bill Clinton were on Letterman on Tuesday. You had some problems with the tone of his endorsement of Barack Obama. ... Do you think Bill is hesitant about Barack Obama? ROCK: Yes, they get it. The whole audience was in on it. But, you know, hey, the guy's in a weird position there. His wife ran for the thing and she didn't win. KING: The next night, on "The Daily Show," Jon Stewart asked Clinton about the Letterman appearance and Clinton suggested that Obama supporters who questioned commitment are missing the point. I understand people supporting Mr. McCain. But a Democrat that's going to just be mad is -- there's something kind of really messed up about that. KING: Have you always done political humor? KING: When you started, did you do politics? ROCK: I'm interested in the world. Jon Stewart does political humor. Bill Maher does political humor. I talk about stuff the way guys would talk about it at the barber shop. I don't belong on any panel on this show. You know what I mean? I don't deserve to be near Roland Martin and Anderson Cooper and all these guys. I try to talk about politics in a way a guy that works at UPS would understand. KING: You did a lot of Brooklyn stuff. ROCK: I do all sorts of stuff, Larry. All sorts of stuff. You know, I hope Obama wins just because, you know, the country needs it. The country needs a change. We kind of seen what this whole McCain thing is. And I'll go with the guy with one house. The guy with one house is scared about losing his house. KING: I never thought of it that way. ROCK: It is that simple.